All the features of the astonishing aqueduct tunnel at Santa Fiora. The Chambers of this roman structure had filled to a depth of three metres before it was converted to be used as a church. The Aqua Traiana had many aquifer sources in the hills surrounding the volcanic basin of Lake Bracciano. Two of our favourite Aqueduct Hunters from the United States join us regularly to raise the star-spangled-banner aloft over our discoveries. The most fearless of the Aqueduct Hunters. 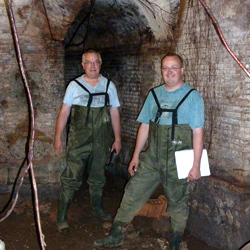 The Aqueduct Hunters Need You! With your help we can carry on and continue filming in HD the full story of Rome’s ancient water supplies. Click here to support us and make a donation. 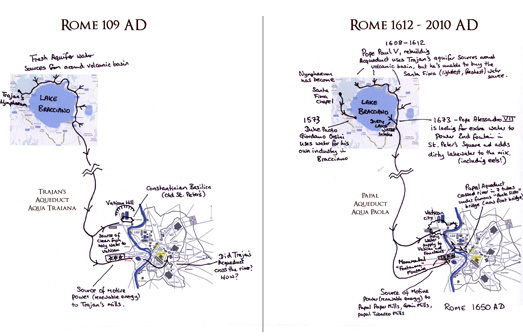 Rome in the time of the Etruscans was just a small settlement by a muddy, unpredictable river. The people suffered with cholera, typhus, malaria, famines, fleas and floods. Yet in just a few hundred years it grew to be the greatest empire in European history. By then they had clean drinking water, splendid public baths, latrines, laundries, sewers and industrial scale food production with water-mills powered by aqueduct water. The Roman Aqueducts are among the greatest achievements in the history of Europe. The Roman Empire was a successful civilisation due to the health of its citizens who drank clean spring water. Although more than 600 aqueducts were built throughout the Empire, the Roman technology of the capture of the waters is almost a total mystery. In the early second century, the Emperor Trajan completed a great restoration of the existing Roman city aqueducts and ordered the building of a completely new system, inaugurated in AD 109, to which he gave his name. In his lifetime the population of the city grew to more than a million, and the dominion of the Roman Empire reached its furthest boundaries. The engineers of the Aqua Traiana captured the pure water from numerous sources in the mountains around Lake Bracciano in Etruria north of Rome, and brought it through water-proof underground conduits more than 40 miles to " every region " of the city of Rome. After the aqueducts were cut by barbarian invasions in the sixth century, the sacked city declined rapidly and the population fell to less than fifteen thousand people. For over a thousand years much of the engineering knowledge was lost. By the time of the renaissance, when the aqueduct was restored and reactivated by Pope Paul V, even its name had been forgotten. Now the primary source of Trajan’s great Aqua Traiana is identified again. Over a prolific spring water source in a web of ancient Etruscan grottos, the Romans built a Nympaeum, a sanctuary to honour the local water deities. The copious water supply was captured in a remarkable stone-built water filtering system under the vaulted shrine. The Roman building has been concealed under a medieval hermitage and church for many centuries, but we have now taken our bright lights and HD cameras down into the underground chambers and galleries and filmed the unique Roman engineering structures, in a remarkable state of preservation. The spring water is today pumped to the nearby town of Bracciano, and the aqueduct only fills up after heavy rain. The site is now under attack from rapacious fig trees. The roots are penetrating more than ten metres underground. Following our discovery we have enhanced our plans so that we can film the urgently needed conservation. Our hope is to encourage the authorities to excavate and restore the Roman sanctuary. It is not yet known when it was converted to early Christian usage, there is so much still to learn.